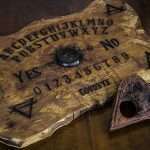 Ouija boards can accidentally and deliberately summon demons and spirits and this Ouija Board for kids can be one of them! 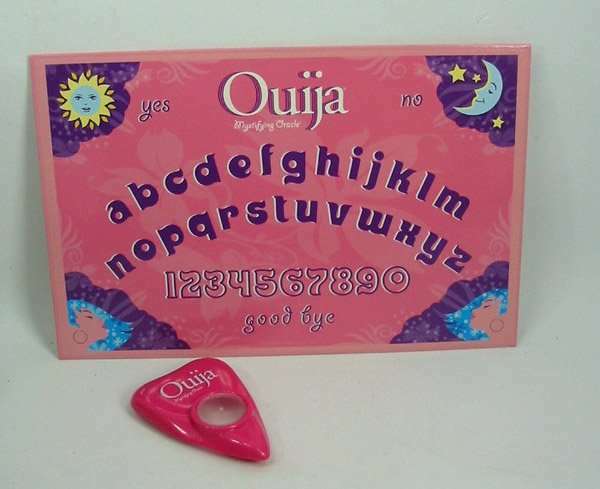 What do you think about this pink Ouija Board? Would you give it to your kids? Even though Hasbro has been selling a brown and black Ouija board for decades. The Ouija board shown on this page is clearly made for a child, certainly no one past their young teen years. So either Hasbro is pedaling religion to children or it’s turning divination beliefs into a sort of a joke. Below are some of the comments from customers that bought this ouija from Amazon! “The reality is that this “game” is a tool. And just like any tool, it can be used for good or evil. …. unfortunately, this particular tool is NOT designed for use for good. There are very specific ways to do this (speak to the dead) the “right” way. God has that very clearly under control and perfectly managed. For evil, on the other hand.. that playing field is wiiiiide open! And this “game” is just a little part of that wide-open, evil playing field. Yes, sounds like a grand idea to encourage little children to open their hearts and souls to the Evil one. Excellent! Better yet, let’s aim it at little girls.. who could possibly grow up to be women, the guardians of the home and the nurturers of the next generation. Let’s destroy them before they even get there, right? Let’s plant seeds of confusion and fear. Let’s teach them that there is no right/wrong.. rather, that “whatever” works, because that’s a damn good idea. No! Don’t teach little girls to garden or cook or read or explore or discover or build or teach or lead or solve their own problems. Yes, let’s teach them to rely on sources of unknown integrity to answer their questions. That’s just brilliant. The box has a cut-out that makes the carrying case visible from the front. The box shows exactly what the box contains in pictures right on the back! The carrying case is pink and is made out of vinyl and plastic. It has the sun and the moon in the top corners. The bottom corners have a graphic of a girl with purple hair and puckered lips as if ready to give you a kiss. It has a very large graphic of the Ouija Mystifying Oracle and a large graphic of the hot pink Planchette. The back has a very large graphic of the Ouija Mystifying Oracle and pretty graphics of flowers in each corner. It feels fairly durable for something that is mostly plastic. The case has two shoulder straps that are a thick plastic and it looks cheap. There are zippers on both sides of the carrying case and zips and unzips fairly easy. On the inside of the case it has a compartment for the Ouija board, Planchette, and Question cards.. Everything fits snugly inside this case. The Ouija board is very nice and is pink with purple letters. The “sun” and “moon” symbols are in yellow and baby blue. The layout of the board is exactly like the boards from the past. This board is very durable and is made out of the usual “Masonite” and is not cheap cardboard. The back has flowers surrounding the OUIJA Mystifying Oracle brand name. Very girly and nice looking board! The Ouija Planchette is in hot pink and has a different shape than the usual planchettes that come with standard Ouija Boards..it reminds me of Valentines day candy hearts. The window is plastic with a tiny pointer that sticks out under the window. It feels cheap but is perhaps more durrable than the classic planchettes included in standard Ouija games. It has rounded corners and has the Ouija Mystifying Oracle graphic printed on the top. “ASKING QUESTIONS USING THE CARDS: Players take turns drawing cards and choosing a question to ask. Ask only one question at a time. Ask your question slowly and clearly. 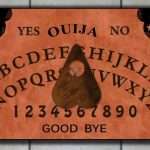 Allow the planchette to “float” across the board to reveal in the window either yes, no, a number, or letters of the alphabet. It may help to start by choosing yes or no questions. In 2008 Parker Brothers and Hasbro Toys merged together to make a Ouija Board just for girls. 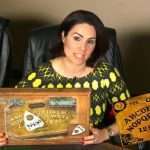 This was an experiment between the two companies to see what marketing techniques they could employ to increase the sales of an already dwindling toy, the Ouija Board game. 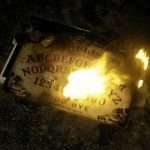 Despite their efforts to do away with spooky propaganda and to introduce more kid friendly play, the Ouija Board pink came under fire from religious groups and parents alike. 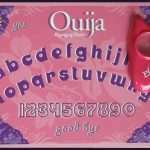 The controversy stemmed form the belief that makers of Ouija Board pink were exploiting little girls to get interested in the occult and there was quite an upset concerning some of the questions included on the cards. The concern from many were the questions themselves..many had an adult themed element and this upset many parents. 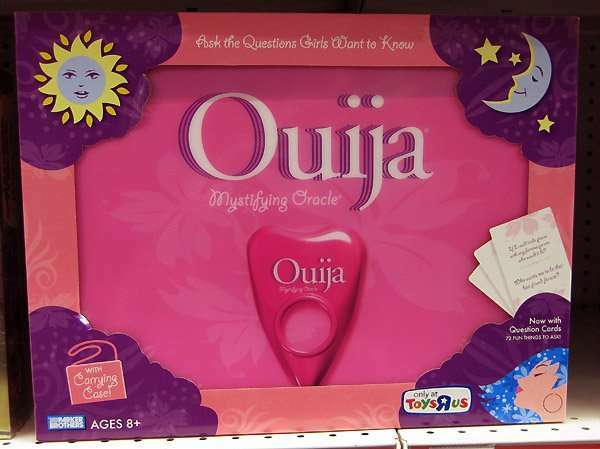 Shortly after Hasbro bought the rights to the Ouija Game from Parker Brothers and quickly decided to pull the plug on Ouija Board pink. Only a couple hundred were ever produced and Ouija Board pink would go down in history as the worst concept ever devised by a toy company. Oh where do I begin? First of all I love this version of Ouija Board not only are the ideas clearly thought out but the product itself is very high quality. The carrying case and planchette have some quality issues certainly but the issues are very small and ultimately minute. I attempted to play the game with my family and had boys and girls ranging from the age of 9 and 14 join in. The boys were a little apprehensive at first because of all the pink but soon wanted to get involved with the rest of us. The girls seemed to have the most fun with the carrying case and used it to put their dolls and what have you inside of it. We did try to use the Ouija Board to contact “spirits” but this didn’t last long as both the boys and the girls quickly lost interest. We probably had the most fun using the question cards and took turns answering the questions. We tried to re-invent the game by having the kids guess what answers their playmates might answer…but in the end this had a life-span of about 30 minutes. 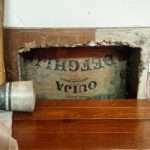 I used Ouija board when I was a kid & we did get in touch with a ghost, they haunted my house, they were evil & we eventually had to get our local vicar to bless my house, this worked, but there is still a child presence in the house though I haven’t seen it like the others, but it plays tricks & hides things. Do Not let children any where near these as they are an easier target for the spirits to stick to. This not a joke.